It was perfectly understandable, just some minor things. Great funny article anyway. What is your source for this by the way? Eh, some cute websites like Jandan.net..
Yep, gonna focus more on some minor mistakes ..
- Sangtisuke also helpsthe local residents to pick coconuts, in the reward of a bottle of milk. - They work as local police to improve relations and has benefited the traffic conditions. The above sentence isn't quite correct, though easily understood. One might ask: "what has benefitted traffic conditions?" and there wouldn't be a really good answer (of course, the implementation of police monkey's, but gramatically you can't find the antecedent, the subject that has to do with has). You could rewrite it as: They work as local police to improve relations and this has benefitted the traffic conditions. Or: They work as local police to improve relations and that has benefitted the traffic conditions. Or: They work as local police to improve relations and they have benefitted the traffic conditions. I also believe benefitted should be with double t. Correct me if I'm wrong. Awww, that's too cute ! And smart, too. Great article, good job ! 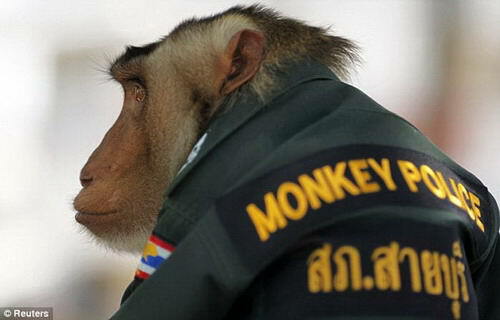 In the Sabri district of Yala province in Thailand, the local police hire kind of new "police officers" - the stump-tailed monkey monkeys. 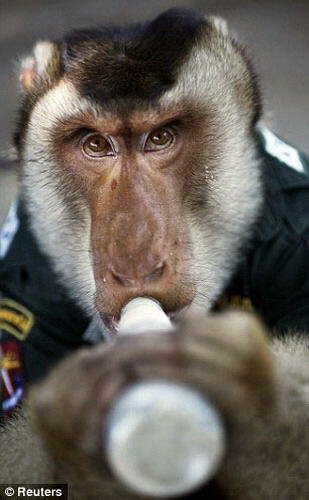 Monkeys wear a special police uniform, which seems funny and cute. They work as local police to improve relations and has benefited the traffic conditions. Yutthapol Phromdao Yutthapol, a policeman,said, to work with Sangtisuke is too much fun, because there is no need to force the drivers to stop for check.The drivers are willing to slow down at the sight of the cute monkeys, sometimes even get off to play with the monkeys as well as taking some photos. 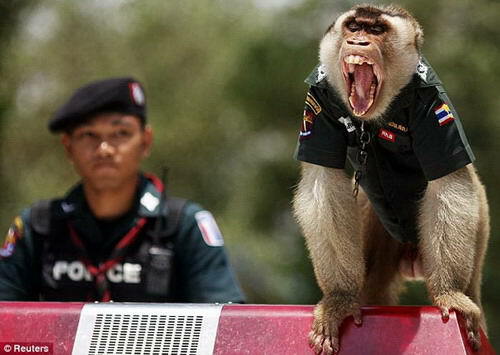 Sangtisuke dressed in police uniform. Sangtisuke also help the local residents to pick coconuts, in the reward of a bottle of milk.